Latest news, notices and announcements from Pulborough Angling Society, to send us your news items, catch reports or items of interest, please email go-fishing@pulboroughas.com or visit our Facebook, Instagram, Twitter or YouTube. Ant, Allan, Ian, Terry, Mark T, Graham S, Glen, Tim, Doug, Barry R, Dudley and Eddie. Sorry i couldn't make it today, had every intention of being there, but was too unwell to attend im afraid. Please note Goose Green will be closed to anglers all day on Thursday 28th March 2019. Club Chairman, Steve Moulding, resigned from his position at the AGM after 8 years in the role. The committee and members wish to thank Steve for his work and dedication over the past 8 years as chairman and also the work he has done with the juniors over the years. Paul Hazeldine was elected at the AGM as Chairman. Visitors to Goose Green over the past week will not have failed to notice the construction of a new rain shelter in the car park. We would like to thank Paul Holden for donating his time, labour and expertise to the club in constructing the shelter. We have set up a YouTube account, its very much in it's infancy at the moment, but over time as we add video's it will hopefully turn into a powerful resource about our fisheries. Net found and owner contacted, our thanks to Paul Holden who found it this morning. Landing net head lost at Goose Green today in the car park by Tench Pond path. Should anyone find this, please get in touch with us and we will put you in touch with the rightful owner. Many thanks to everyone who helped with the netting of Kingfisher Pond at Goose Green earlier today. All other fish caught were returned to Kingfisher Pond. The ponds will be monitored over the coming months, so a factual, scientific conclusion to the study can be reached. We would like to express special thanks to the Environment Agency for all their hard work, advice and professionalism. Photo's of the netting to follow shortly. 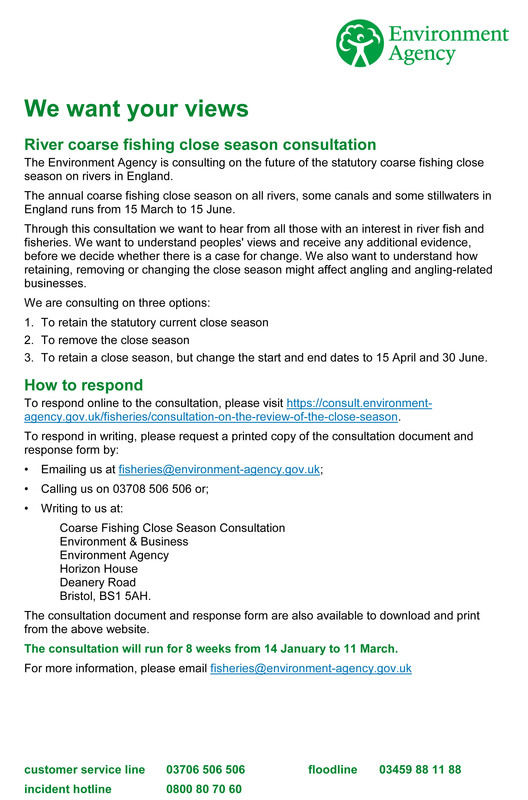 7 February 2019 - Rivers Closed Season Consultation. Your chance to have your say about the future of the close season on Rivers. Consultation closes on 11th March 2019. May we remind members that per our rules you ARE NOT PERMITTED to cut down any trees or vegetation and to do so risks you losing your membership, today we found a number of trees between pegs 18 - 21 that have been cut very recently and left with high stumps. We will not let all the hard work of our volunteers who work tirelessly to keep the fishery looking nice to be destroyed by a few idiots who feel the rules do not apply to them, well to these idiots we simply say the rules DO apply to you and they will be enforced, we therefore suggest that you read & inwardly digest them. If our rules are too difficult for you or you feel they do not apply to you, then with respect, we suggest you find an alternative angling club to join as we do not vandals and litter louts in our club. An excellent turn out for the work party at Goose Green today, i had hoped to attend for a short while today, but unfortunately my health situation decided otherwise. Ant, Allan, Eddie (also for the photo's), Barry R, Paul, Terry, Mike R, Dudley, Ian, Charles, Lewis & Martin. By all accounts an incredible amount of work was undertaken by those involved, further work parties are planned for the not too distant future, please keep an eye on the club website, Facebook page and of course the huge blue notice board on the container that you can't fail to miss. You will have by now or will shortly receive your newsletter and membership renewal reminder. When sending in your completed membership application, would you please ensure that you have completed the data protection (GDPR) section of the application, this is vitally important if you wish to receive club communications, if we do not receive your signed consent, you wont get a newsletter/membership reminder next year. If you do not receive a newsletter from us, this is most likely because you didn't complete the GDPR section of your membership application last year giving us your permission to send you club communications. Please note, that as from Monday 26th November 2018 the gate at Stretham Bridge on the River Adur will change to an electronic locking system, access is limited to between 8am and 5pm daily, if you arrive before 8am you wont be able to get in and if you are there after 5pm you will be locked in. Following last evenings committee meeting, we are pleased to announce the winner of our logo competition that we launched earlier this year, where we asked you to redesign our logo with next years centenary in mind. The winning entry comes from Paul & David Hazeldine and will be incorporated into our website, Facebook page, membership cards etc in time for our centenary membership year in 2019.